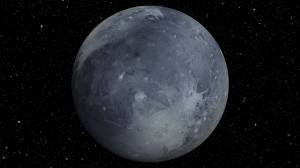 Technically, Pluto's name is now 134340 after being declassified as a planet. Because of Pluto's irregular orbit, there are periods of times when it is closer to the sun than Neptune. Aside from Charon, Pluto has 2 smaller moons that were found in 2005. Pluto is smaller than the Earth's moon. The color of Pluto is reddish-brown. Pluto has an enormous moon for its size, Charon. It is more than half the size of Pluto. The sun would look like a bright star from Pluto, since they are so far away from each other. Pluto's thin atmosphere contains traces of methane, nitrogen and carbon dioxide.